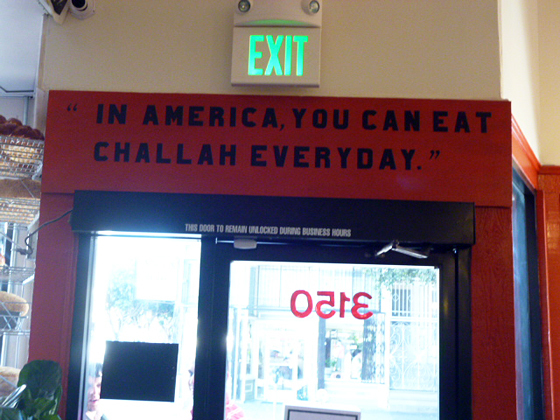 Much ado has been made of the new permanent home of Wise Sons -- the first Jewish deli in the Mission and, arguably, the only Jewish deli in San Francisco worth eating. The powerful but petite eatery’s proprietors, Evan Bloom and Leo Beckerman, have become local media darlings, featured everywhere from a fiery hot chef competition, to blogs, newspapers, and upcoming in Sunset magazine and perhaps on local TV show Dine and Dish. I myself, giddy after finding the long-craved 2nd Avenue Deli-quality eats of my people, gushed about them in this public love letter earlier this year. Bloom and Beckerman grew dissatisfied with their careers in construction management (Bloom) and non-profit medical development (Beckerman), and came together because of their love for food. Through kitchen experimentation and recipe development, the menu is a continuing work in progress. Its influences come from a number of sources -- the glossy cookbooks of Joan Nathan and Secrets of a Jewish Baker, as well as spiral-bound DIY cookbooks from synagogues, Jewish community centers, temple sisterhoods and the like, “each featuring six different recipes for Matzo Ball Soup, all slightly different, as well as Mrs. Schmendrick’s Husband’s Favorite Soup,” says Beckerman. Nothing served, however, is verbatim of any written formula, family-derived or otherwise. 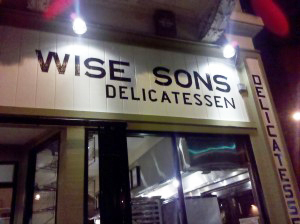 The challah is on the sweet side, and even though Wise Sons is not a kosher eatery, they opt out of butter in the recipe to keep it parve. And because it’s 2012, it’s topped with flaked sea salt just to make it awesome. And while Beckerman, who oversees most of the baking while Bloom takes on the meat and the savories, wanted to make his grandmother’s babke with nuts, raisins, and meringue, they opted for chocolate instead. “We ended up going in a different direction,” says Beckerman. “As soon as you put in nuts and raisins, it narrows down the audience. People have allergies.” Right. This is, after all, San Francisco and not the 1947 Lower East Side. The brisket for the pastrami and corned beef is cut to Wise Sons’ specifications by Creekstone Farms in Kansas. But why not use what’s local and grass fed? Beckerman unapologetically explains, “The truth is that we found out that grass fed animals are much smaller and too lean, and the pastrami doesn’t come out as nice. There aren’t enough cows in the Bay Area to do what we do,” -- which, on an average Tuesday at their Ferry Building kiosk, can easily mean 150-200 lbs. 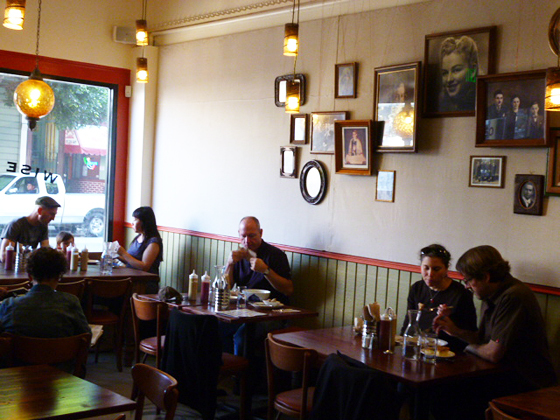 of beef and still a lengthy line-up of customers craving Reubens. Beckerman and Bloom’s brand loyalty for ingredients is unbending. The chicken soup starts with Mary’s or Fulton Valley. The matzo and matzo meal is Streits. The flour is Giusto’s. And, true story: I wanted to buy a whole babke to send to my mother for Chanukah last December, but I was out of luck because the particular Guittard chocolate used in the recipe -- E. Guittard 72 percent cacao -- wasn’t available. And rather than settle for a chocolate substitute, Beckerman told me, there just wasn’t going to be any. This is the same reason you’ll only find bagels on Saturdays -- when Beauty's can deliver them. “I’d rather serve no bagels than crappy bagels,” he says. “Do you want twice as much of something half as good?” Wise words, indeed. Hours: Wednesday through Sunday, 9am to 3pm. Closed Monday. Serving Tuesdays at the Ferry Building 10am to 2pm.